A swage nut or self-clinching nut is a type of nut or threaded insert is used on sheet metal. A PEM® nut is a popular brand name by Penn Engineering & Manufacturing Corp, which is often used generically for swage nuts from any manufacturer. It permanently anchors itself to the sheet metal by swaging the surrounding material. Generally, the swage nut is made of a hard metal such as stainless steel, which is inserted into a pre-drilled hole in a softer ductile material such as aluminum. The inserted shank has three diameters: a main shaft which fits the hole closely, a thin smaller-diameter undercut, and a larger-diameter serrated clinching ring. Forcing the clinching ring into softer material, with an arbor press or by tightening a screw through the hole, causes it to plastically deform (swage) into the annular recess in the shank. This locks the nut into the hole. The knurling on the clinching ring is not necessary for this step, but prevents the nut from rotating after installation. 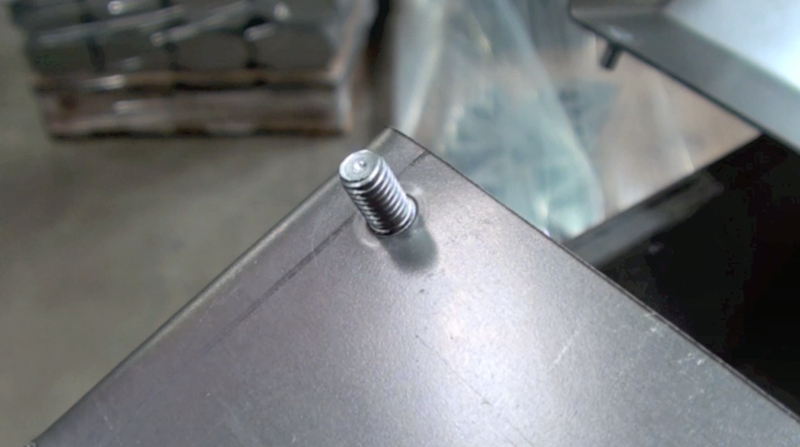 This is a popular method for adding strong, load-bearing threads to a relatively thin piece of soft sheet metal. A rivet nut, also known as a blind nut, rivnut, threaded insert or nut-sert, is a one-piece internally threaded and counterbored tubular rivet that can be anchored entirely from one side. There are two types: one is designed to form a bulge on the back side of the panel as a screw is tightened in its threads. The other is similarly drawn in using a screw, but is drawn into the sleeve instead of creating a bulge. Rivet Nuts and its assembly technology are used in wide range applications: 1. Cars and motorcycles, bumpers, safety belts, airbag, etc. 2. Commercial vehicles, trailers, fire engines electrical and electronic products, safety cabinets, etc. 3. Food processing industry, ovens, extraction hoods, fast food counter, etc. 4. Heating and ventilation plant, air condition units and heating boilers, etc. 5. Office furniture, cash registers, chairs, desks, photocopiers, etc. 6. Building and civil engineering, street furniture, conservatories in leisure area, climbing walls yachts, swimming pools, etc.